Major Arthur Jackson Bushell was born in Toronto on 10 May 1891, son of Walter Bushell and Harriet Jackson. He joined The Queen’s Own Rifles of Canada circa 1909 and participated in the 1910 trip to England to participate in training with the British Army. When the First World War was declared, he joined the Canadian Expeditionary Force – twice- and was wounded at Passchendaele before being discharged as medically unfit. Bushell continued his service with the militia in the Toronto Regiment, formed in 1920 primarily from returning soldiers of the 3rd Battalion, Canadian Expeditionary Force. And he continued to serve with the Royal Regiment of Canada after its formation in 1936 from the amalgamation of the Toronto Regiment and the Royal Grenadiers. On 18 Jun 1923 Bushell married Gertrude Leah Rowlison in Toronto and in 1928 they would have son Douglas. He joined the active Canadian army at the outbreak of hostilities in 1939 and was recognized at an early stage as “fine officer material”. 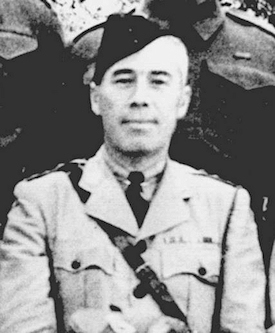 On December 6, 1941, Major Bushell was assigned to Camp X (a Special Operations Executive training camp) as the Adjutant-Quartermaster and the Commanding Officer’s right hand man. A Canadian, Bushell’s responsibility was to be the liaison with the Canadian NCO’s and with the British Officers to ensure that things operated smoothly at the Camp. He died ? and is buried in Park Lawn Cemetery ,Toronto. In the original 3rd Battalion nominal roll, he is listed as a Sergeant with No 2 Company. 14 May 1915 – Re-enlists as a clerk and posted (again with the rank of Sergeant) to the Pay and Records Office. 6 Nov 1917 – Receives serious shrapnel wound to his leg during the Battle of Passchendaele. 3 Aug 1918 – Discharged again as medically unfit. At Camp X in 1943 or 44. Bushell is third from the right.